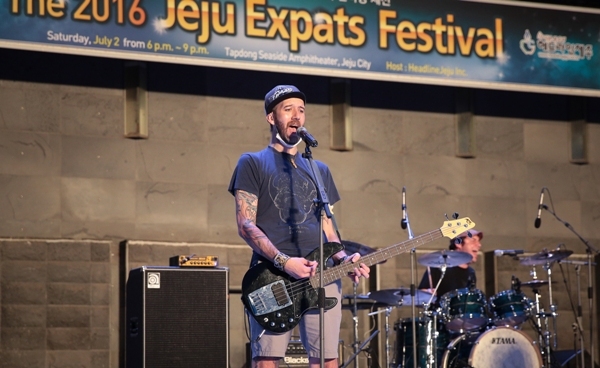 Groovy vibes flowed along the ocean breeze in Tapdong when the 2016 Jeju Expats Festival came to town. The event, on Saturday July 2, featured an eclectic musical lineup, enthused crowds, and an impressive market of craft goods and food. Headline Jeju has organized this popular event four years running, and it has become ubiquitously looked forward to by the foreigner community. With the principal goal to bring the diversity of Jeju together, the festival organizers hope to also promote Jeju globally through its expat residents by creating a fun, celebratory atmosphere. And what fun was had. This year attendees got to buy darling trinkets and garble down greasy goodies at the expanded market adjacent to the Tapdong Seaside Amphitheater. In one corner, teacher Flor de Maria Talamantez showcased her colorful jewelry from her native country, Peru. Down the way, you could find Lithuanian artist Agne Latinyte’s distinctive pieces of cartoony haenyeo women divers and dol hareubang grandpa stone statues. Never to be missed, graphic designer Ideo (aka Cyril Brenner-Loegel) from France hawked his caricatures, playful celebrity portraits, and cutesy creature drawings. A new addition with a mission was the Gotjawal Dokkaebi Market, celebrating the value of Jeju’s Gotjawal forests. Meaning forest, rock, and bush, gotjawal is located across the island. Lore has long warned locals of the mischievous dokkaebi goblins that inhabit its foliage, but these days the gotjawal has to worry about a newer threat: development. Luckily, profits at the Gotjawal Market were donated towards the preservation of the forest. Festival organizer and expat resident Alexis Oesterle expressed her gratitude for the event. “This is a great opportunity to share our cultures, especially through the delicious food here. There’s South African and French. The kebabs were amazing too,” she said. Indeed, the food overall was pretty amazing. At the South African food booth, they served staples such as malva pudding, vetkoek and curry mince, and boerewors rolls. It was like a crash course on South African cuisine right on top of your tastebuds. Of course, the music is really what got the party started. The opening traditional Korean percussion band helped the audience’s hearts to rage with patriotic pride. Then the Bang Band from Pyeongdae Elementary showed off the incredible talent of their precocious youngsters. Later, Italian-born American Chris HM serenaded with some Bob Dylan-like sounds and American Jessica Gomez sang moody tunes accompanied by her giggly personality. Big Jay, an institution among the expats and a Canadian, growled songs about his mom into the mic while playing his bone-adorned guitar. Additionally, Ruth Minnikin, who is a regular rock star back home in Canada, bestowed us with her angelic voice and melodious storytelling. Finally, DJ FREAKX took it home with some bouncing beats and an uproarious dance party. Yet another year of rocking-out has been enjoyed by locals, tourists, and expats—and this time we even got to avoid the rain. The Expats Festival shows that indeed, as the motto goes, the world comes to Jeju, and Jeju goes to the world with fun.